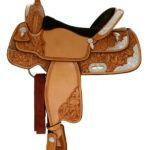 Best Lightweight Western Trail Saddles – How Do You Choose? Used Billy Cook Saddles – Wise Investment or Highway Robbery? Western Horse Saddle Parts – What Makes Your Saddle Work? When it comes to Western saddles, Billy Cook Saddles is synonymous with quality and craftsmanship. Though Billy Cook Saddles are well designed for both the rider and horse, not all saddles are alike. You can’t trust most Billy Cook Saddle reviews online though. Why is that? Most Billy Cook Saddle reviews aren’t thorough. 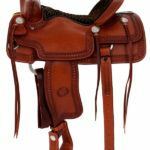 So I’ve decided to give you detailed information in this article on the different types of Billy Cook saddles and their functions. I’ll explain the different types of horse saddles so that you can decide which saddle is best for your horse and your riding needs. Horse saddles are made with specific uses in mind. You wouldn’t buy a show saddle, which is used in competitions when you really need a horse saddle that will allow you to work on a ranch trying to steer cows, would you? Of course not. You need to buy the right saddle for the right purpose. But what if you don’t know the purpose of different saddles? The problem I have with Billy Cook Saddle reviews is that they don’t explain the different types of Billy Cook Saddles. So I’ve taken the liberty of doing so in mine. 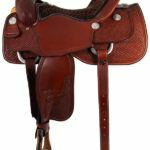 Billy Cook All-Around Saddle – An All-Around saddle is ideal for a wide range of work around the ranch. The seat is flatter to allow movement and easy adjustment for the rider. The seating is often padded with suede. Often close contact skirting to help in giving leg cues. Reinforced rigging for light roping, made from a strong wooden tree. Strong horn, made high for holding on. 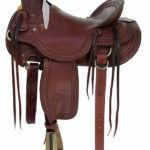 Billy Cook Trail and Pleasure Saddles – If you go for long horse rides in all sorts of conditions, this is the saddle for you. 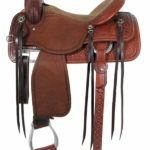 This saddle is usually built with a lightweight tree, is not designed for heavy ranch work and comes in large varieties. 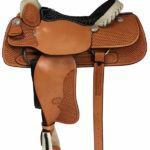 This saddle is designed with higher and lower cantle. A higher cantle gives you more protection, while a lower cantle gives you more comfort. Because of the stress put on the saddle, rigging is usually in-skirt. It’s also equipped with lots of leather ties to attach your gear. Billy Cook Barrel Saddles – If you’re looking to leave your competition in the dust, this saddle is designed for elite speed. Designed with high cantle with deep pocket seat to hold the rider in. High horn, shorter skirts and in-skirt rigging. 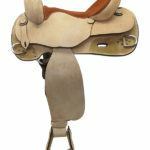 Mounted Shooting Barrel Saddles – For quick draw and stability. This saddle is designed with a high cantle for extra security, a forward tilted swell, suede seats to hold you in place, roughout fenders and jockeys for extra stability. Best of all, it’s lightweight. Billy Cook Cutting Saddles – Cutting is the art of separating a cow, steer or calf from the larger herd. If you’re working on a farm or ranch, this saddle is designed to keep you balanced and out of the way of the horse during sharp starts and stops and turns. 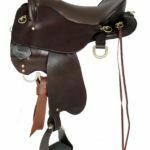 This saddle is designed with a low cantle, high pommel and horn. The seat is flatter with a slight rise at the pommel. Jockeys and fenders often designed from rough out leather for better grip. Reinforced rigging, back cinch and slim stirrups and has leather wear strap between fenders and bottom skirt. Endurance Saddle – This type of saddle is designed with a very comfortable seat for long endurance rides. It’s small and lightweight with lots of stings for attaching gear. Most don’t have a horn. In order to keep the saddle from tipping this saddle is designed with center-fire rigging. 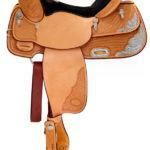 Billy Cook Ranch Saddles – This saddle is for ranch work. It’s big and heavy, the seat is slick and hard for comfortable day-long use. It’s designed with high cantles and back straps. And it’s made from a sturdy tree for rigorous ranch work. 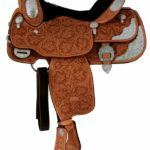 Billy Cook Reining Saddle ­– This saddle is designed with close contact saddle with skirts to allow the rider to communicate with the horse easily while performing complicated maneuvers during reining pattern. The horn and pommel are lower for ease of movement of reins without interference. Flatter seat for hip movement. Billy Cook Roping Saddle – Best for roping (as opposed to recreational riding). Made from an extremely sturdy wood tree with bullhide, rawhide, or very strong fiberglass covering. It’s designed to take the abuse of holding a calf. To reduce the stress to the horse’s back, this saddle is made with a wide gullet. The low cantle and shallow seat enables the rider to quickly dismount during ranch work or competition. Reinforced rigging attached to tree. Seats are suede and padded. Billy Cook Show Saddle – Not good for everyday riding. But is very good for competing. It’s a very detailed saddle. Detailed tooling. It comes with silver on the skirts, cantle, pommel, horn, and stirrups. The seat is balanced and has a pocket to keep the rider in the proper position. Turned up stirrups, padded sued seats. Often close contact with lower pommel and horn for better cues to your horse and rein control. 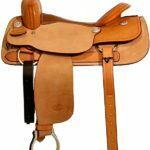 Training Saddle – This saddle is designed with reining saddle type tree. It has low pommels and cut out skirts for close contact with your horse. Designed with lots of dees and rings to attach training devices or aids. Padded suede seats; fenders and jockeys are roughout leather for better grip. I recently had the pleasure to ride with a Billy Cook Wade Ranch Arbuckle western saddle, and after two days of riding I’m quite sure that this was the most comfortable saddle I’ve ever used. As with most of Billy Cook saddles, the Wade Ranch was built for those who ride long hours. When you first look at this saddle, the craftsmanship is obvious from the 4-inch horn to the deep seat. The fine leather is decorated with a waffle pattern around the border, and smooth hand-worked leather lines the split ranch seat. The rigging is made up of flat plate brass hardware and holds a 27-strand mohair cinch. The tree is made up of Wade rawhide covered full quarter horse wide bars. After a full day’s ride, there were no noticeable dry spots or white spots on or near my horse’s withers which only attests to the great fit this saddle has to the horse. This is especially true on wide backed horses. The fenders are pre-turned, which cuts down on the breaking-in time required with a new saddle. The stirrups are 3 inches wide and covered with rawhide, which protected me from wear and tear on my shins, which usually occurs with a new saddle. At 42 pounds, this saddle is heavy, which attests to the craftsmanship put into it. The deep seat kept me well balanced and in position throughout the day. This saddle also helped my horse from tiring as the day wore on. In addition, because we were on some very narrow trails, my horse was able to concentrate on the trail ahead. Even on the second day, my horse did not shy away from the saddle when it came time to get back to the trails in the morning. This only proves to me that the horse liked the saddle as much as I did. 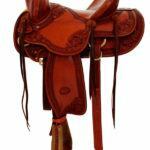 The saddle also contains plenty of straps for tying on bedding or saddlebags. The flank strap was wide and correctly positioned for my quarter horse. I really cannot find anything to complain about in the saddle. Because of the high-quality craftsmanship, I believe my Billy Cook Saddle is going to last me a lifetime. I’m looking forward to buying a Billy Cook Saddle for myself. My son has become quite the horsemen himself. I know when I am gone, he’ll have fine memories of me when he rides in one of these Billy Cook saddles. Now, I’m not tooting my own horn, but isn’t this one of the best Billy Cook Saddle reviews you’ve read online? What’s your experience? Please leave your comments below! As I make horseboxes for a living but no nothing about horses or riding ! I thought I’d have a read & see if I could be inspired ? I didn’t know how much attention is paid to a seat ? But I guess when your sat in it for long periods of time it has to be just right. What a great website Shalisha. Thanks for taking the time to research and to share such interesting information. I can see that you know your stuff and that you are a horsie person. I love saddles and owned a few in my days. I love visiting your website as I always find something new and useful. I look forward to your next article. @Paul: Yes, absolutely. Much detail goes into these saddle seats! Thanks for stopping by. @John: Thanks for stopping by John. Yes, I love horses. More importantly, I hate to see horses suffer because they’ve been saddled with the wrong horse saddle. Very interesting article, I no very little about horses and I had no idea there where so many types of horse saddle. I have seen people who collect saddles and people who even use them as decorations. Thanks for sharing, I love learning new stuff. Thank you for the detailed information on the different types of saddles. I didn’t realize that there are so many variety. I love the pictures that you have for each one. It gives me the visual of what to look for. From your experience with horses, I am wondering if horses can tell the difference on the quality of a saddle. Do they perform better with one versus another? Until I found your site I had no idea there was such a huge range in horse saddles. I am not a rider myself but my daughter regularly goes to her friends place and helps with her horses. She loves riding and regularly has a ride then. She would love a horse of her own but I have neither the money or the space. I will show her this site as I am amazed there are so many saddles! I am learning lots by reading – thank you. While I know nothing about saddles, it is because I know next to nothing about horses. Not too many around here. I do see how thorough your review is and it should be very helpful to your readers. Are you involved in the horse business in some way? A hobbyist or competitor? I have to admit I’m blown away that there is a specific saddle just for show, and then another kind for roping? Is there really a lot of poor reviews out there of these saddles? @Paul: I’m definitely not a competitor. But I do love horses. Yes. All saddles have a specific function. There aren’t poor reviews of the saddle that I know of. It’s not the saddle’s fault that the riders are picking the wrong ones. LOL. Thanks for commenting. @Paul. Hi there. Thanks for commenting on my post. Yes, there are different saddles for different disciplines. Each discipline requires the saddle to function in a certain way. For instance, with a roping saddle, it’s more important for the horn be attached very securely because when the calf is roped, the stability of the horn is crucial. No. I’m not a competitor. I just love horses. Hello Shalisha, nice post. I like horses, and I have seen one up closely not too long ago. I know what a saddle is, but I never really knew nothing about them until I read your article, great information provided. I plan to try out a horse one day, and a Trail and Pleasure saddle would fit my needs. Thanks again, and continue to do what you do!!! @Ahmad Ballard: Thank you for your comment. Each saddle is contingent upon the intended purpose. I hope you have fun riding. This is such a helpful and informative post, you obviously know your stuff and the breakdown of the different type of saddles is really helpful. 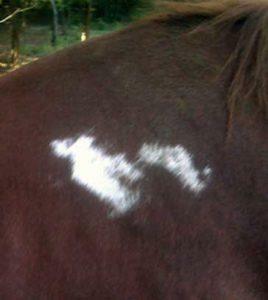 I wasn’t aware that a poor fitting saddle causes white marks on a horse, Why is this? Hi Amy. Thanks for the post. The reason the saddle causes white marks on the horse is that the follicles of the hair underneath the poor-fitting saddle are damaged and in some cases destroyed. 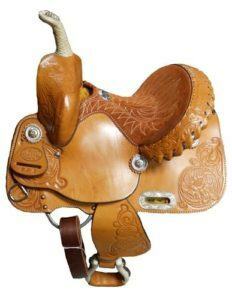 Wow, I really like the Billy Cook saddle and there are so many to choose from. The craftsmanship looks to be superb. Which saddle would be the best one for just every day trail riding? Would be purchasing a used Billy Cook saddle be ok, I mean will I see a bit of a cost savings? Hi Matts Mom. Thanks for your question. I think purchasing a used saddle is best if you simply want to go trail riding. As you know, horse saddles can be expensive. I’d say buy a new saddle only if you have a specific riding discipline in mind and you’re in for the long haul. Elaine and Scarlett on Used Billy Cook Saddles – Wise Investment or Highway Robbery? I noticed that during my horseback riding lessons, the horses always seemed to be in distress. They weren’t just in distress when I rode them, they were in major distress when other people rode them. © 2019 Horse Saddle Comparison. All Rights Reserved.